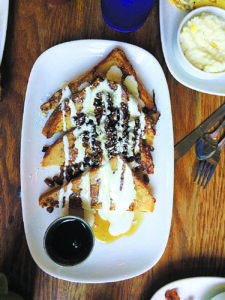 The signature French toast served at Inman Park’s Folk Art comes in four whopping slices topped with pecans, powdered sugar, icing, syrup and additional maple syrup on the side. The breakfast treat stuns customer with its decadence. “Over easy” refers to preparing eggs such that the white is cooked while the yolk is just barely set to provide the perfect combination of textures. This column, much like its namesake, strives to provide the perfect balance of early morning sustenance and Atlanta culture. If you are familiar with anyone on the Food Network, chances are, it’s Guy Fieri. Restaurateur, author and TV personality, he is funny, endearing and just as knowledgeable about great food as his hair is spiky. “Diners, Drive-Ins, and Dives” is Fieri’s popular Food Network show, where he travels the U.S. tasting the best dishes from classic diner-type restaurants. In 2015, Fieri traveled to Inman Park in Atlanta to taste all that local restaurant, Folk Art, has to offer. Although the show did not feature any breakfast items, a few of the burgers and sandwiches on the brunch menu were shown, including the “triple d meatball burger,” which chef-owner Jason Hill taught Fieri how to make on-air. Folk Art’s menu displays the series’ logo next to the items that were featured, in case you are considering touring the country in a quest to taste everything Fieri did (which I honestly consider on the daily). My trip to Folk Art included a lot less cameras, but was not any less delicious. One thing to know about Folk Art is that it is a staple of the Inman Park neighborhood, well-loved by locals and by quite a few who travel to try. That means you’re in for a bit of a wait, no matter the time. Folk Art does not take reservations. 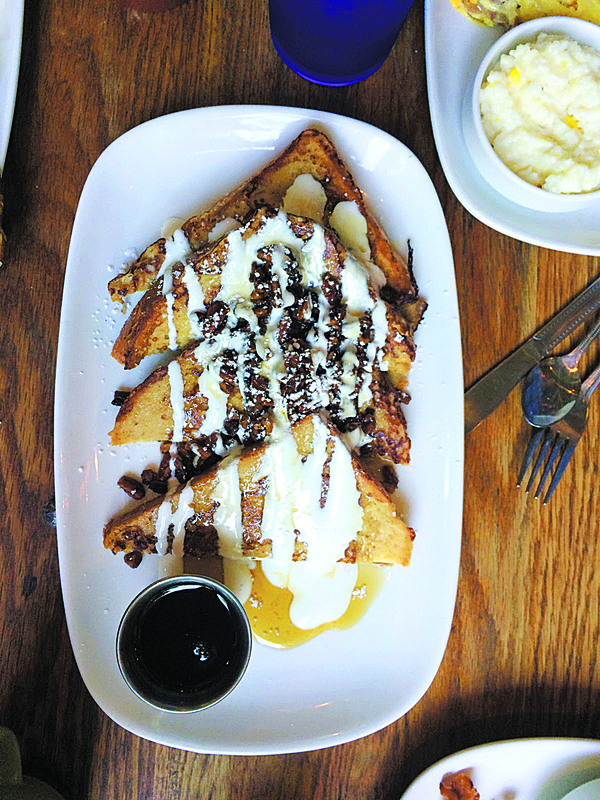 Their brunch menu is served from 9 a.m. to 2:30 p.m. Saturday and until 4 p.m. Sunday. I ordered a cup of coffee and two eggs, scrambled, but was there with a group. Thankfully, my friends and I decided to splurge on an order of their cinnamon pecan sticky bun French toast for the table, which the waitress recommended. A mouthful in so many ways. Folk Art serves Lakehouse Coffee, an Atlanta coffee supplier found across the southeast. It was flavorful and strong; I think I had five cups. My egg breakfast was really tasty — the highlight was the grits. Folk Art’s grits came with pieces of corn in it, something I was not used to. The corn added a bit of texture, but the grits were just as creamy and savory as I would have hoped. The breakfast also comes with a choice of meat. I went for the turkey sausage: cooked well with a host of seasonings. It rounded out the standard two-egg breakfast. The French toast served as the perfect dessert. It came topped with pecans and powdered sugar, drizzled with icing, in a syrupy sauce which puddled around the pieces of toast in addition to a side of maple syrup. The toast itself was fairly typical, but let me tell you — it was sweet. The waitress’ recommendation of just ordering one to taste and split was perfect; I could not have eaten more than a few bites without heading straight to the dentist. The brunch menu is large, featuring everything from cheesy appetizers to burgers to waffles to salads. Some highlights include three variations of sweet potato pancakes, “Foul Play:” chicken and waffles with whiskey peach compote and six variations of eggs benedict, including one with lobster and spinach. Folk Art opened in 2013, revitalizing an old grocery store. It has a trendy atmosphere, with exposed brick, large windows, and natural lighting. The decor is charming — each wall is covered in signs of all sizes and materials. Some are old Georgia license plates, some vintage advertisements, some from local artists’. It gives you a feeling of nostalgia and pride for the city, in theme with the historic feeling of Inman Park. Early on a Sunday morning the place was filled with families, young couples and groups of hungry brunchers excited to taste of one of Hill’s creations. It was a fun place to eat, not only because of the endless coffee and delicious eats but because of the welcoming atmosphere and charm.